All he wants is to be a mariachi, like his father, his grandfather and his great grandfather before him. But the town he thinks will bring him luck brings only a curse - of deadly mistaken identity. 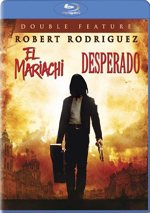 Forced to trade his guitar for a gun, the mariachi is playing for his life in this critically-acclaimed film debut from director Robert Rodriguez. Some filmmakers hit the big time with a small-budget release and then quickly vanish from sight. The guys behind The Blair Witch Project fell into that category; 11 years after their big break and we never heard bupkus from them. However, quite a few others capitalized on their early cheap-o hits to establish real careers. Both John Carpenter and Kevin Smith started that way, and we can also add Robert Rodriguez to the list. While his debut feature didn’t make a boat of money, it did put Rodriguez on the map. He made 1993’s El Mariachi for a remarkably low budget of $7000. Rodriguez continues to shoot for much less money than pretty much anyone else, but he’ll never touch the bargain basement nature of El Mariachi. 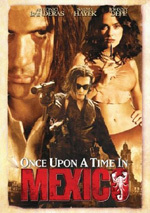 Set in Mexico, the film starts with a confrontation between Moco (Peter Marquardt) and a former member of his gang named Azul (Reinol Martinez). Azul went to jail, where he runs some simple criminal operations out of his cell. Moco owes him many, which he attempts to claim after he offs the three men his former friend sent to kill him. Azul gets out of jail and takes his trademark guitar case full of weapons with him to get his pesos. In the meantime, a wandering mariachi (Carlos Gallardo) arrives in town, where he tries to get work but fails to nab a job at a local bar. Immediately after he splits, Azul comes in on the trail of Moco and shoots up the place. When he hears of this, Moco brings in Bigoton (Jaime de Hoyos) and his gang to nail Azul. Armed only with a loose description of Azul, the table is clearly set for misunderstanding, as it’s obvious the goons will mistake one guitar case carrier for the other. The rest of the movie follows what happens after that misidentification occurs. Mostly the Mariachi attempts to stay alive and rectify the problem. He connects with barkeep Domino (Consuelo Gomez) along the way. She takes pity on him and gives him a place to stay until things blow over, but inevitably, romance blossoms. We watch what happens as things head toward a violent climax. El Mariachi brought Rodriguez to prominence partly due to its budget. Indeed, it’s almost impossible to believe this thing only cost $7000. Technically, it didn’t; the final product on the disc got some post-production work that occurred after Columbia picked up the flick. However, that little layer of polish doesn’t alter the mind-bendingly cheap nature of the original production and the fact Rodriguez delivered so much for the money. Not that one should expect a terrifically professional affair, as Mariachi definitely bears the scars of a low-budget film. The actors seem stiff and unconvincing at times, and the whole thing has the feel of a project made on the go. Nonetheless, those qualities almost never become negatives. The quality of the acting doesn’t rise above a level of basic competence, but it doesn’t often need to do so. Mariachi presents a rapid-fire action flick, and tremendous acting talent doesn’t seem necessary for that sort of movie. However, an eye for style is important for such a tale, and Rodriguez has that in droves. The flick becomes cartoony and hyper-stylized at times, such as when the Mariachi meets the one-man band; after a rapid zoom, Rodriguez delivers an auditory screeching of tires plus the insanely loud cracking of knuckles. Those moments could become irritating, but the director only sporadically unleashes them, and the film’s general energy keeps things moving well. Rodriguez displays a great eye for action staging, and these pieces usually come across as exciting and creative. He also uses well-placed humor to defuse – and occasionally extend – tension, such as during the chase sequence at the hotel. Parts of El Mariachi seem predictable. Heck, the entire plot is easy to read; as I already alluded, it’s not exactly a shock when the mistaken identity thread develops. The movie also moderately peters out as it heads toward an inevitable confrontation at its climax. Nonetheless, El Mariachi displays the strength of a filmmaker with nothing to lose. Shot for almost no money and made with very low aspirations, the flick plays out as a charged and exciting piece. Despite a mix of flaws and some cheesy production values, the film resonates with energy and remains an impressive – and entertaining – movie. El Mariachi appears in an aspect ratio of approximately 1.85:1 on this Blu-ray Disc. Due to budgetary issues, El Mariachi demonstrated a lot of iffy visuals, but it looked acceptably good given those restrictions. The film showed the various issues often connected with 16mm movies, though sharpness usually looked pretty solid. Some of the shots came across as a bit soft and tentative, but most of the movie was acceptably detailed and distinctive. I saw no issues related to jagged edges or shimmering, and edge enhancement was absent. Print flaws were sometimes difficult to judge given the original material. Grain caused the highest level of distractions, but clearly those elements stemmed from the film stock. Some daylight scenes suffered from no problems in this realm at all, but others and the lower-light shots created a very grainy image. I also noticed quite a few examples of specks, marks and blemishes; these did decrease as the film progressed, but I saw plenty of defects throughout the film. Colors varied, also due to the film stock. Most shots demonstrated nicely vivid and broad tones that looked appropriately dynamic and tight. However, others – usually interior scenes – could be somewhat drab in appearance. Black levels were fine, as they showed good depth. Low-light shots tended to appear moderately thick and overly dark, but they didn’t seem terribly problematic in that regard. Though much of the movie looked pretty good, the overall impression remained erratic; some scenes were strong, but others were ugly. The print flaws were my main complaint. The film’s DTS-HD MA 2.0 soundtrack fared better than the visuals. The film came presented in the original Spanish, though it also included English and French dubs. The soundfield didn’t dazzle me, but it seemed appropriately engaging. Music showed nice stereo imaging and the effects helped create a modest but useful sense of atmosphere. Much of the audio remained pretty centered, but a mix of elements popped up in the side speakers, and they meshed together reasonably well. The action scenes offered the liveliest sequences, though quieter bits seemed pretty convincing as well. Surround usage seemed to be non-existent, which appeared to be a change from the earlier DVD. If any info came from the back speakers, I didn’t hear it; this came across as a straight stereo presentation. Audio quality seemed positive from start to finish. Speech sounded natural and lacked any issues connected to intelligibility or other flaws. Music was warm and dynamic, as the guitar-based score presented crisp highs and warm lows. Effects came across as accurate and tight. They didn’t show any distortion as they captured the original elements well. Bass response was deep and rich but didn’t display any concerns related to looseness or boominess. Overall, the soundtrack of El Mariachi impressed me, at least given its budgetary constraints. How did the picture and audio of this Blu-ray compare to the 2003 DVD? The Blu-ray was superior, though the constraints of the source material limited its improvements. I thought the BD’s visuals were tighter and more dynamic, but I noticed more print flaws. Perhaps these were also there on the DVD and simply seemed less noticeable, but I thought they were more prominent here. Still, the movie demonstrated obvious improvements in other areas. The audio was a wash, and the DVD might actually be the superior mix, if just because it presented some light surround information. Otherwise, the pair seemed awfully similar; they were both quite good given their origins. Most of the DVD’s extras repeat here. We open with an audio commentary from director Robert Rodriguez, who offers a running, screen-specific piece. The director can be a very chatty participant, and here he gives us a nice look at the creation of his film. Rodriguez clearly remains proud of the fact he made El Mariachi on a nearly non-existent budget, and this track mostly lets us know how he did so. He covers all the ins and outs of no-budget movie-making and provides a concise and lively discussion of the processes. The emphasis remains on the technical elements – and how to avoid paying much money for them – but he never gets bogged down in dull minutiae. At times Rodriguez repeats himself, and his tendency to refer to actors by their character names gets a little old at times, but overall the commentary seems informative and entertaining. Someone alert the false advertising folks: the disc’s Ten-Minute Film School actually runs 14 minutes and 37 seconds! It packs scads of information into that span, as we get a great look at how Rodriguez shot Mariachi on the cheap. He narrates the program as we watch raw film footage, a few behind the scenes shots, and finished clips. Rodriguez touches on many techniques he utilized during the production. He already chatted about more than a few of these in his commentary, but the fact we can watch them as well makes “School” more valuable. It’s a briskly paced and very informative piece. Made in 1990, we find a short film called Bedhead. It runs nine minutes and seven seconds and tells a tale of a tormented girl who gets psychic revenge on her awkwardly-coiffed brother. The movie seems rough and amateurish but shows enough style to become somewhat interesting. Even if it stunk, however, it’d make a nice historical addition to the set. Does the Blu-ray lose extras from the DVD? Yup – it drops a mix of trailers for El Mariachi and other films. Shot for about half the price of a Civic, El Mariachi rarely totally overcomes its budgetary restraints. However, the movie usually surpasses expectations and actually allows us to forget its amateurish roots. It seems lively and exciting and remains much more entertaining than most blockbusters. The Blu-ray presents decent picture plus surprisingly positive audio and some very nice extras highlighted by an excellent audio commentary. El Mariachi provides a memorable ride, and this Blu-ray offers a reasonably good reproduction of it. 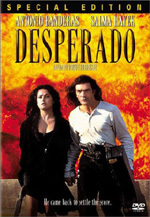 Note that you can only purchase El Mariachi as part of a two-pack that pairs it with remake Desperado. Both appear on the same Blu-ray Disc. With a list price of about $20, this is a good deal.